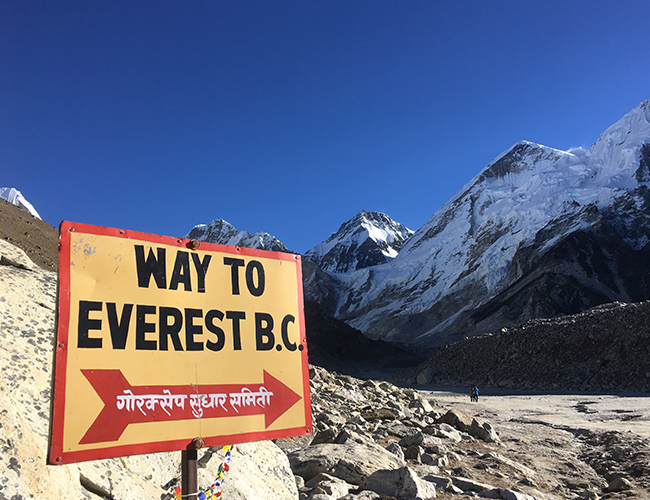 EBC1 spent late October and November trekking their way through the Khumbu valley of Nepal reaching the heights of Kalapater at 5545m above sea level before spending a couple of days relaxing in Namche Bazar. Nepal is sandwiched between Tibet (China) in the north and surrounded by India in the south, east and west. This regional positioning of Nepal lends its self to a variety of cultures and influences from its neighbors (it is also worth mentioning Bhutan influences are evident in some regions of the country). As with all of our Nepal tours we explore Kathmandu and some of its many temples prior to our trek beginning. Our team enjoyed the day with our Nepalese city guide who was just a wealth of knowledge sharing the Hindu and Buddhist cultures he knows so much about. The day ended with a visit to a reputable and high quality singing bowl shop where we discovered bowls as tiny as your hand up to the size that you could bath a child in. Singing bowls make a pleasant ringing/humming sound when rubbed with a stick around the top edge of the bowl (it takes a little practice to perfect this method). Upon returning to the hotel it was a mad rush to purchase our last minute trekking items (or in Robs case all of his trekking attire lol) from the discounted lines in quality outdoor clothing manufacturers such as Marmot, Mountain Hardware and North Face. We found some great bargains with Gortex jackets from $130 and insulated jackets as cheap as $200 (normally $3-480 in Australia). That evening we spent our first meal as a team together in a Tibetan restaurant a short drive away. Manju our head Nepalese guide joined us for our meal and acquainted himself with the team. One of the biggest highlights of the tour is the flight in and out of Lukla that has been dubbed by some as the world’s most dangerous airport. The airport renamed Tenzing–Hillary Airport in honor of Tenzing Norgay and Sir Edmund Hillary, the first people to reach the summit of Mount Everest. The landing and take offs use the entire length of the runway, the actual length of the runway is 527 m (1,729 ft.) × 30 m (98 ft.) with a 11.7% gradient sloping from the end of a mountain back towards solid reinforced embankment (no room for error here from the pilots). In addition to this Lukla have two Helicopter pads to add to the hive of activity with only minutes and sometimes seconds separating the arriving and departing aircraft. The height of Lukla is 2840m above sea level and above 2,100m where the saturation of oxy hemoglobin in humans begins to plummet. As the human body increases in altitude it can experience altitude related sickness due the lack of air pressure on the atmosphere. The pressure on our bodies is about the same as ten meters of seawater pressing down on us all the time. At sea level, because air is compressible, the weight of all that air above us compresses the air around us, making it denser. As you go up a mountain, the air becomes less compressed and is therefore thinner. So although the percentage of oxygen in the atmosphere is the same (20.9%), the thinner air means there is less oxygen to breathe. This is the same on the summit of MT Everest with the % of O2 still at 20.9% although at 8848m, the standard barometric pressure is 34 kPa (253 mmHg). This means that there is 33% of the oxygen available at sea level. The human body is able to adapt and acclimatize up to an altitude (this is of course variable from person to person) approximately 7600m from here you enter what is phrased the death zone where the human body no longer acclimatizes but begins to slowly break down and die eliminating brain cells and muscle fibers every minute spent at this altitude with out supplemental oxygen. There are 14 8000m peaks that require mountaineers to enter the death zone in order to summit, most high altitude mountaineers mange to enter the death zone although the compulsory return back to the land of oxygen saturation does not always occur with many climbers succumbing to HACE and HAPE – High Altitude Cerebral Edema or Pulmonary Edema. Other causes for their deaths are due to their ability to function or think at a normal level of orientation resulting in falling to their death from not clipping properly into a fixed safety line, slips or falls while ascending/descending precipitous ridges or ice walls. Large crevasses in moving glacier icefalls (flowing/melting ice from a mountain) also claim many mountaineers although these tend to be at levels outside of the death zone. One last interesting fact that’s not all doom and gloom is the time it takes to soft boil an egg at sea level as opposed to 5140m (the height of our highest night on our Everest Base Camp trek). @0m with the egg temperature @ 0 degrees centigrade = 4 minutes and 49 seconds. @5140m with the egg temperature @ 0 degrees centigrade = 8 minutes and 47 seconds, nearly double due the decrease pressure which forces water’s boiling point to be at a much lower temperature requiring an increase in cooking times. 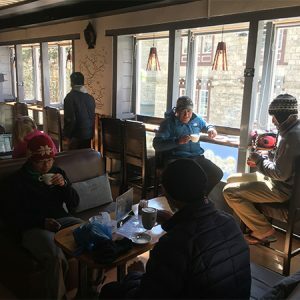 Once on the ground in Lukla our nervous but excited group gather, at a lodge for a hot cup of tea and begin the 2-day hike to Namche Bazar a bustling village and administrative center for the Sherpa people in the Khumbu region. The first 2 days of the trekking can be arduous and mildly physical although the altitude and thinner air begins to take its effect with increased respiratory rates and a decreased circulation rates. Some surprises along the way where the clear views of Everest twice on the way to Namche and once again on our rest (acclimatization day) day in Namche with a brief walk up to the Panorama Hotel. Namche presented our group with the last chance to stock up on supplies, medications and additional layers at relatively cheap prices. The next 3 days we spent much of our time ascending in altitude although as always in mountain environments you tend to spend a bit of time traversing and going down usually before a steep sustained climb awaits you. 3 days on from Namche we find our selves at Dingboche at a height of 4410m above sea level and our team are starting to experience the disruptive Khumbu cough along with a common cold. One team member Al had his worst nights sleep here and luckily enough had a rest day in Dingboche to recoup a few hours of sleep and rest. 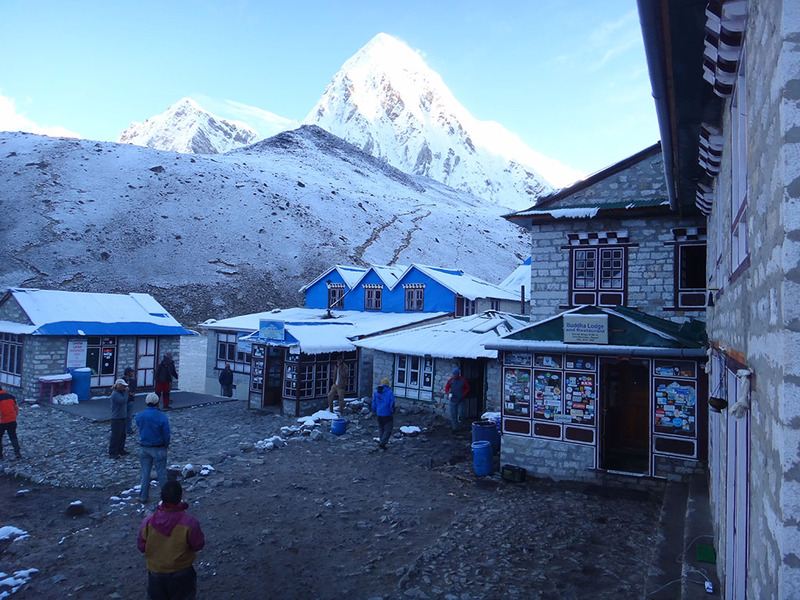 Dingboche presents you with a superb view of Island Peak (6189m), Lhotse (8516m) and Makalu (8485m) but to name a few of the Himalayan peaks surrounding us. Following our rest day in Dingboche we slowly trudged on towards Dughla (4620m) where it was decided to spend an addition day in Dughla (2 days) to allow for the teams bodies to catch up with the increased altitude. It is much better to take an extra day or two on the ascent to ensure you reach your goal of Everest BC and Kalapatar than to push onwards and take the risk of being evacuated for AMS, HACE or HAPE (all altitude related illnesses that can be deadly). Trekking from Dughla to Gorak Shep (5140m) Jing found this a tough day mentally and physically with the endless piles of rocks and glaciers to step over. 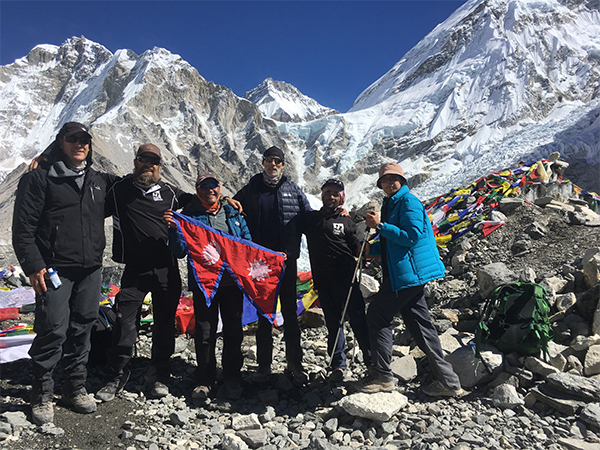 Upon arriving to Gorak Shep the over all shape of the group was fine with some mild AMS symptoms that with a little rest disappeared overnight for the trek up to Everest Base Camp (5364m). The trek out to BC and back is a long one taking anywhere from 4-6 hours return at 5364m. The standard barometric pressure is 53 kPa (401 mmHg). This means that there is 53% of the oxygen available at sea level for our bodies to absorb and only 51% of the oxygen available at sea level on the summit of Kalapatar that was to be the case the following day in the cold hours pre sunrise. We struck it lucky for the ascent of Kalapatar with the temperature only dropping to -9 degrees centigrade over night not the -12 to -15 the previous evenings had been (this temperature does not take into account the wind chill factors). Kalapatar serves as one of the best face-to-face view-point for the southern massif of Mt. Everest and the south col. We continued on a long slow descent to Periche followed by Tengboche the following day. These two days although getting easier on the body with oxy hemoglobin saturation see our bodies become more tired and weary and look forward to the much needed rest each evening. The descent down from Tengboche is just as difficult on the other side as our trip up, however the last few hours into Namche is on fairly level terrain and one of the most scenic and enjoyable parts of the tour. Now back in Namche we can once again eat meat products as we have had to sustain from eating these in the region from Namche to Base Camp and back due to the Sherpa people being of Buddhist religion not allowing them to kill and slaughter animals meaning the meat has to be carried in on the backs of porters from Lukla. First meal up on the table in Namche is the famous Nepalese chili chicken followed by yak sizzler, two of my absolute favorite meals worldwide. Being back in Namche brings us the luxury of hot showers, cafes serving coffee, cakes and freshly baked biscuits. Together in Namche we explore the bustling village streets of Yaks, cows and mules (no cars here), street vendors sell everything from fake North Face, Mountain Hardware and Marmot to name but a few of the reasonably good quality clothing on offer. North Face has actually opened up a store here recently in their attempt to capture some of the trekking trade as people who have not brought the right layers of enough warm clothing. Sherpa Adventure Gear (a Nepali brand) has a store here and their clothing is great value and as every bit as good as North Face. Our team made several trips here to acquire some souvenirs to take home, as this brand is not available in Australia. One afternoon we all gather in a café to watch a Sherpa movie and enjoy a couple of Illy coffees, while Rob went to church……… Well his Australian church (the pub) for a quite ale and brushed shoulders with a Sherpa who had summited Everest several times. We all enjoyed our time in Namche and the hospitality of the lodge owners at Hotel Tibet it was quite sad to depart but we had to head back to Lukla which we decided to do over 3 days. Reaching Lukla Jing was noted for saying, “is that it! 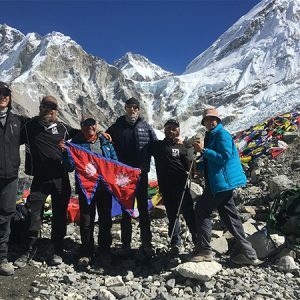 !” trekking to Everest Base Camp and back again on one leg, which was an amazing achievement for her and the rest of the team. 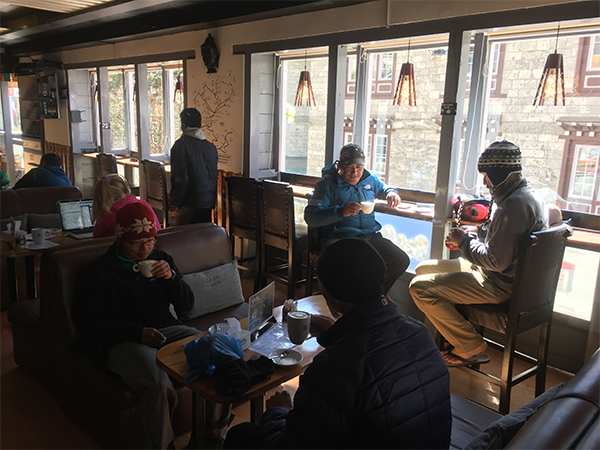 Before checking into our lodge we decided to grab a cappuccino and black forest cake to celebrate in the sunroom of the café watching over the planes landing and taking off at Lukla. Our time in Lukla was also well spent relaxing in the lodge catching up on the latest events back home on the lodge’s Wi-Fi. A mandatory session filming and photographing the planes landing and taking off on the short runway a real must for the first time traveller to Lukla. Not before long we are back in the air on route to Kathmandu. Once back in this busy but enjoyable city we had one long hot shower scrubbing ourselves clean again ready for the pamper session at the hotels adjacent spa (massages here cost $30 approximately for 90 minutes) that is a real tranquil and clean paradise to return to. Our last 2 days in Kathmandu where spent sightseeing over the city traveling to Sherpa Adventure Gear store (Kathmandu), souvenirs shopping and visiting some cafes and bars that the area has on offer. The cuisine is amazing here with Nepali food complemented by continental, Indian, Chinese, Tibetan and Pakistani foods giving you a diverse choice. Our last night was spent at the 5 star restaurant Mul Chowk (Baber Mahal Revisited) that is set in an old Palace. The food here is spectacular and on par with any Australian 5 star restaurant. It was a spectacular way to conclude the trip as a team in a relaxing fine dining atmosphere. Before long we were all departing on our flights back to Australia with a feeling that each team member has not yet finish with Nepal yet! 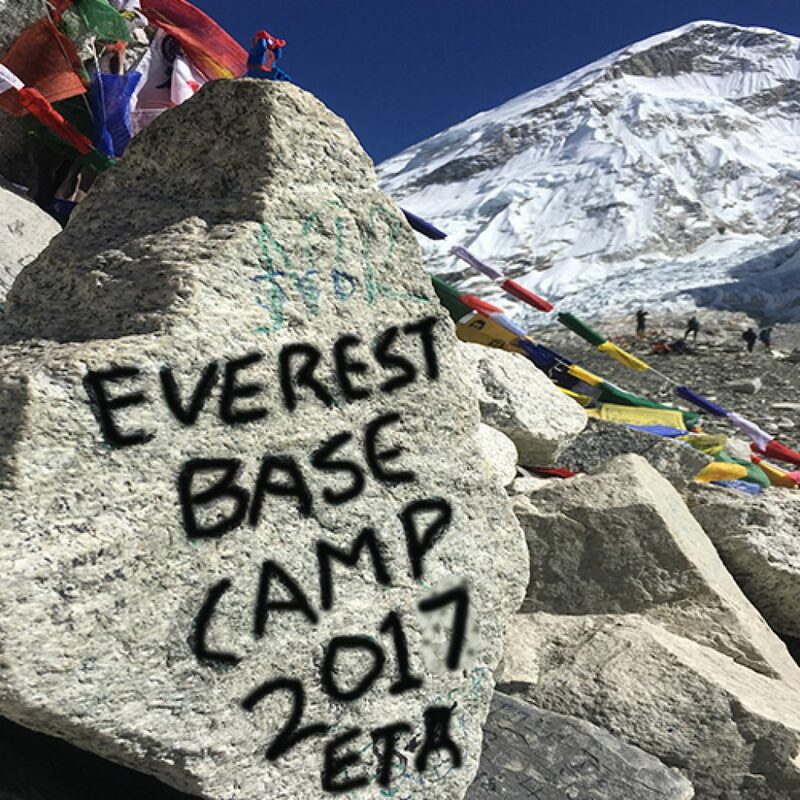 Our Everest Base Camp trip for 2016 was delighted to have one special participant taking part. Jing is a Neuroscience Masters student (having been an emergency room doctor for some time) from Canberra who has a passion for adventure. She has taken part in a few bushwalking activities including Cradle Mountain summit, the Cinque Terre in Italy, and closer to home, Mt Kosciuszko (three times). She is also an avid road cycling enthusiast, and in recent years, venturing into the world of mountain bike riding. So what? One might say. Well, Jing is an above-knee amputee who lost her right leg at the age of 14 to bone cancer. For many, this might have taken their drive away for adventure and outdoor pursuits but with her very supportive family, this physical disadvantage was not going to hold her back and in fact brings out her natural zest for life even more. I met Jing at an information session at Mountain Designs in Canberra early 2015 where she asked me if I would consider taking an amputee to Everest Base Camp, my reply was “sure!” believing that if you put your mind to it you can achieve anything. So the foundation was set and 2 years in the making when we found ourselves in Kathmandu together with the rest of our team. Rob (one of our team members) on the first day meeting Jing commented “geez that’s no good having a stiff leg already” (he noticed her slight limp and step-by-step climb when she ascended a staircase at the Buddha Stupa). Jing replied “oh the leg is not sore I have a prosthetic leg”, to Rob’s embarrassment…he felt like he had a bad case of foot-in-the-mouth disease. Rob’s glare at me said it all, why didn’t you tell me. This was not the last time Jing had to encounter an ‘interesting’ conversation. During the security checkpoint at Kathmandu domestic airport a guard frisked Jing’s body only to stop at her right leg grabbing hold of the prosthetic leg and asking with a bit of shock, “what is this? !” I think the security guard was more embarrassed about the whole situation when she realized what it was. 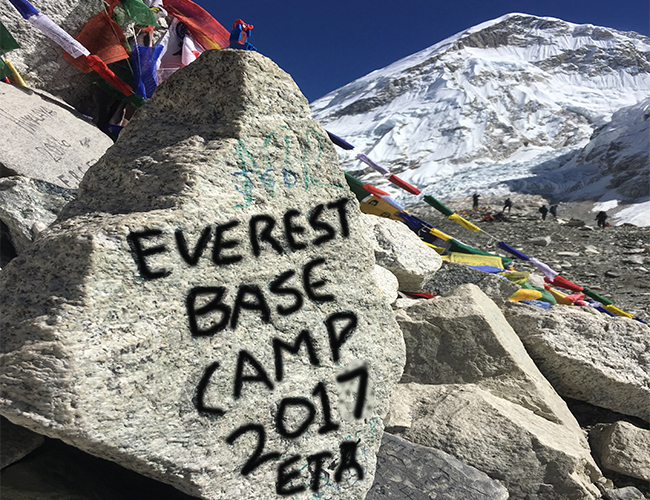 Trekking to Everest Base Camp is a truly difficult challenge for anybody to undertake let alone for an amputee. Jing had prepared well with plenty of training on the off-track trails that Canberra has to offer. Her balance is exceptional (perhaps this comes from being an accomplished cyclist) and her stamina was as good as anyone else on the Base Camp trail. If only I had a dollar for every person I passed that stopped and looked, asking is she ok, has she hurt her knee/ankle? And for us to reply, no, Jing is fine, she doesn’t have a right leg. The look on the enquiring stranger was often jaw-dropping. I think we had to manage a few cases of dislocated jaws lol. After a tough long trek with a few spills and slips we reached Everest Base Camp and Kalapathar together. This was an amazing achievement for all of our team, however, Jing really shone as the team’s star with everyone involved feeling very proud of her. I guess for the accompanying spectator Jing showed no external signs of giving up, although later she talks of internalizing her negative thoughts, publically she hid this well. There was no time in my mind that I doubted her ability to tick the goal off the list. I knew if she could stay mentally strong we would get there and return back to Kathmandu triumphant. Jing is now toying with the idea to return to the mountains again, perhaps this time completing a mountaineering climb! That for her would be the ultimate challenge. If she had two normal legs, that would be one of her top aspirations, without question.